A unique feature of this beautiful covered bridge is it&apos;s red sides and white portals. It also has a corrugated metal roof. Now closed to cars, the new bridge runs parallel to the old bridge just a few feet apart. There is a paved parking area if you wish to stop and explore the construction details inside the bridge. The original bridge at this location was built by Nels Roney, and like many bridges, it was named after an early pioneer family settled in the vicinity. In 1925, the first bridge was replaced by today&apos;s Currin Covered Bridge at the cost $4,205. 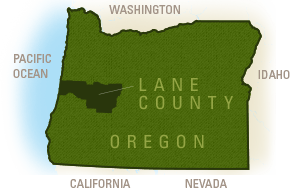 Lane County employees built it themselves to save labor costs. 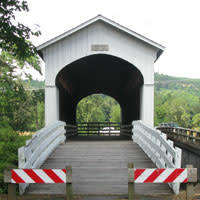 In 1970, the covered bridge was bypassed by a newly constructed concrete bridge, and subsequently closed to traffic. In the 80s, preservation efforts included fumigation, removing an approach and screening off the remaining entrance. 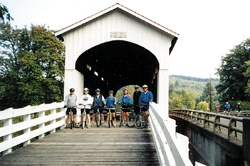 Then as a recipient of the Oregon Covered Bridge Program grants in 1993, the bridge was substantially renovated. Repairs included structural, rails, roof, siding and paint. In 1995 the bridge was reopened to pedestrians. It is a charming spot to stretch your legs and enjoy the river view. This is the only bridge in Oregon that is painted two different colors: white portals and red sides. This 105 foot (32 m) bridge was built in 1925 to replace a dilapidated 1883 bridge spanning the Row River. In 1979, Lane County completed a new concrete bridge just a few feet away and closed the old bridge to traffic. In 1995 the Currin Bridge was rehabilitated and is accessible to pedestrians. Located near Cottage Grove. DIRECTIONS: Go 4 miles (6.43 km) SE on Row River Rd to Layng Rd. Located 1.5 miles (2.4 km) on Layng Rd. The Mosby Creek Bridge is one mile further along Layng Rd.